As I have probably made clear, I am not Glee’s biggest fan. Not by a very long shot. But since it’s a reasonably talked about show, I thought it would be worth it to at least check out the new episode. I’m going to quote the awesome Tom and Lorenzo to sum up this thing quickly: Of course. What I mean by that is that the show has managed (somehow) to neither mature, nor change, despite losing a bulk of its cast and having the option to radically change its direction and save this sinking ship. It didn’t. Instead, what we got was a rehash of the same old characters in new bodies, and the same old characters doing things that were wildly out-of-character. In short, a mess. As a short recap, the end of last season saw most of the power players on the show leave as their characters graduated. Quinn, Rachel, Kurt, Finn, Puck, Mercedes, and Mike Chang all sailed off into the great blue yonder, leaving a desperate few behind in the club. The team won nationals, and it was a decent sendoff. 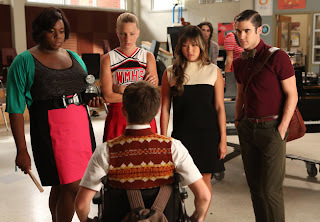 Now it’s the start of the new school year, and the glee club has to find a way to build their numbers back up. And they do it by…basically replacing all the people they already had. They’ve got a new underestimated brunette with a great voice, a bitchy blonde cheerleader, an African-American powerhouse singer, and an emotionally troubled potential love interest for the brunette. Sigh. The episode is called “The New Rachel” and while that’s its nominal theme, about moving on and finding new friends, with a subplot about Rachel in New York trying to figure stuff out, it’s really just about setting the show back at square one. Except without the funny. Sure the musical numbers are cute, and Kate Hudson cut quite a figure as Rachel’s hellish dance teacher, but the show seemed to be a lot more about getting things back to normal than exploring where we are now. Having won Nationals, now we’re supposed to believe that the glee club kids are celebrities in the high school. Obviously all of this fame has gone to their heads, and they’re total jerks about it. Because clearly there’s no chance that three years of character development would make a difference here. They’re all obsessed with figuring out which one of them is going to be “the new Rachel”, or the lead vocalist. They even compete over it, in one of those “where the hell did they get a massive strings section to follow them around” bits. Naturally they can’t decide, but when the team holds tryouts, they find another phenomenal singer who happens to be a bit of a ringer for Lea Michele. Shocking turn of events! Said new singer (whose name I didn’t care enough to remember) is the lunchlady’s daughter and is sad about how everyone picks on her mom. That was sweet, I liked that. When the glee kids realize that they’re being tools about it, they apologize and convince her to stay in the club. It’s cute, if a little ham-handed. The end of the episode, of course, has the glee kids returned to their former social pariah-dom, which I have to say is good for the show but really bad writing. If the high school is one where winning a show choir championship will make you royalty, it seems unlikely that a little sharing and caring in the halls will make you scum. But, whatever. It made about as much sense as most things do on this show. By far the most interesting storyline was Kurt’s, which made me want to pinch myself and check I wasn’t dreaming. Having not been accepted to NYADA for reasons related to plot, I guess, Kurt was bumming around town. Working in a coffeeshop. Going to community college. Visiting his boyfriend at his old high school. Normal stuff. And I really liked it. It made Kurt sympathetic in a way that none of his prior storylines ever really addressed, and it was nice to see the show dealing with a character who has potential but is just drifting now. What do you do after high school? Because now you’re supposed to be an adult. And that’s scary as hell. Unfortunately for my interest, Kurt’s storyline was basically wrapped up by the end of the episode. He’s off to New York to try to make it alongside Rachel. While that makes sense for the character, I did find myself wishing that they could have dragged out his misery a little longer. What can I say? Misery makes good television. The basic upshot of the show is this: if you watched Glee before, then don’t worry because nothing’s changed. If you didn’t, you probably don’t want to start now, because nothing’s changed. And I miss Santana. A lot. Also, Puck's long-lost half-brother. Sigh. Glee is on at 9 PM Thursdays on FOX. Watch at your own risk.